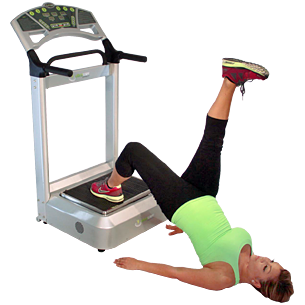 Lie in front of the machine with one foot flat on the plate and the other extended perpendicular to the ground. Lay your arms flat to your sides. Bend your knee and bring your foot toward your buttocks. Squeezing your abs and gluteal muscle, lift your hips off the ground. Lift up onto your shoulders and neck while keeping your back straight. This exercise works your hips, lower back and gluteal muscles.